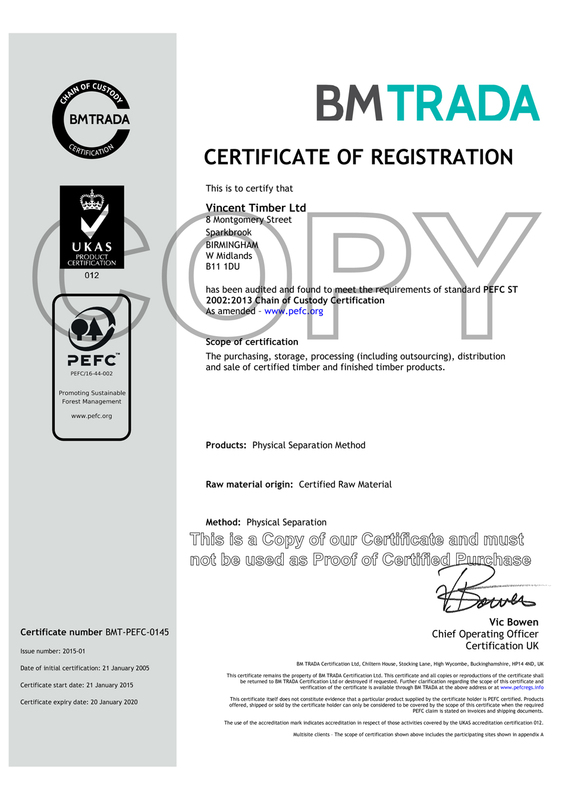 Vincent Timber are at the fore-front of the campaign to protect the environment as illustrated by the fact that the company was only the 2nd company in the UK to be awarded Chain of Custody for CSA and SFI to cover Western Red Cedar. 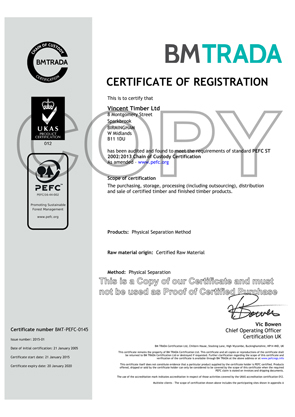 Vincent Timber are members of TRADA and have appointed them as the company's auditors and advisors on their implementation of their "Chain of Custody". The company recognises and accepts its responsibility to the global environment, its customers, suppliers and staff. The company is committed to purchasing its timber from well managed and above all, legal sources. The company will not source any timber species prohibited under appendix 1 of the convention of International trade in Endangered Species (cites). We recognise that independent certification of forests and the process chain is the most useful tool in providing assurances that the timber comes from legal and well-managed forests. Vincent Timber will request and record its suppliers Chain of Custody details that relate to their production and raw material. 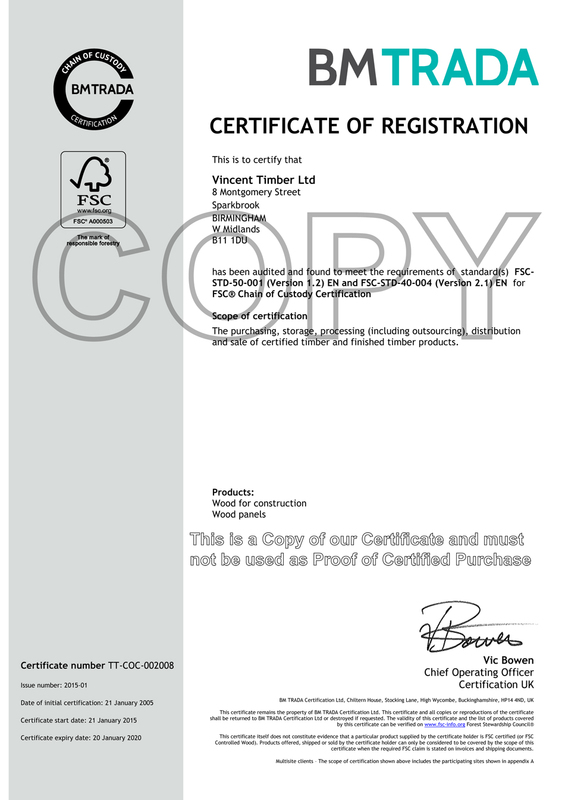 Vincent Timber will avoid misleading and unsubstantiated environmental claims in relation to wood products suppliers. Vincent Timber purchasing is run and maintained by its Chairman, John Vincent, who will ensure that environmental issues relevant to the policy are discussed regularly at the highest level of management. Staff are trained and encouraged to act in accordance with this policy. Concern over diminishing national resources and the state of the environment in general has raised public and media attention around forestry. People want to know if harvested areas are being regenerated, if wildlife habitat is being protected and if the bio-diversity of the forest is being maintained. In a global market, where a customer can be thousands of miles away, providing evidence of well managed forests is increasingly being done through independent, third party certification. Certification is primarily about providing objective evidence of sustainable forestry management. It functions much like a financial audit, where independent experts verify a company's performance against a set of objective standards and procedures for sustainability. Certification is also about meeting social and community expectations. Are companies making their plans public? Are they consulting neighbours as well as sharing the economic benefits by maintaining stable community employment? Credible certification standards include these types of considerations. What is "Chain of Custody"? Chain of Custody refers to the ability to track wood from the time it leaves the forest through the processing and marketing channels to the final consumer. Chain of Custody is of particular interest to buyers of manufactured product who want to verify that a certified product genuinely comes from a certified source. In some cases, labelling is being used to identify wood from a certified forest. The PEFC Council is an independent, non-profit, non-government organisation, founded in 1999 which promotes sustainably managed forests through independent third party certification. The PEFC provides an assurance mechanism to purchasers of wood and paper products that they are promoting the sustainable management of forests. PEFC is a global umbrella organisation for the assessment of, and mutual recognition of national forest certification schemes developed in a multi-stakeholder process. These national schemes build upon the inter government processes for the promotion of sustainable forest management, or services of on-going mechanism supported by 149 governments in the world covering 85% of the worlds forest areas. 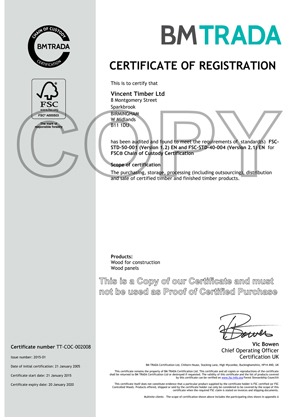 The Forest Stewardship Council is an independent, non-governmental, not-for-profit organisation that offers certification to other organisations. The goal of FSC ® is to promote environmentally responsible, socially beneficial and economically viable management of the world's forests. Founded in 1993 by a diverse group of representatives from environmental organisations, the timber trade, forestry professionals, indigenous peoples, Community forestry organisations and certifiers, the FSC ® places a strong emphasis on social and public participation elements. FSC ® standards are performance-based standards, developed by stakeholder groups. Standards for most regions of Canada are under development at this time. Canada's National Sustainable Forest Management standard is based on international criteria for sustainable forest management and Canada's own national SFM criteria which were developed by the Canadian Council of Forest ministers approved in 1996, the CSA standard has a stringent public participation requirement and companies are required to respect national criteria for SFM at local level as well as address any additional local values. Third party evaluations such as the Council of European Paper Industries have ranked the CSA amongst the best standards in the world. CSA launched an optional Chain of Custody and labelling program in July 2001. The Sustainable Forestry Initiative was developed by the American Forest and Paper Association for its membership, and is now available for use by any interested party through a licensing arrangement. This standard was developed for application in the U.S.A. where the vast majority of lands are privately owned and therefore there is somewhat less of an emphasis on public participation. The SFI program is a comprehensive system and performance-based standard that integrates the perpetual regeneration and harvesting of trees with the protection of Wildlife, soil and water quantities, bio-diversity and ecologically significant sights. Over the past 3 years AF & PA have strengthened the credibility of the standard by introducing a third-party certification process and an independent sustainable Forestry Board with broad representation of interests to govern SFI.